FYI: This week a TON of new trailers hit the web. Instead of embedding 12+ videos on one post, at the end of the selected videos below you will find posters for additional trailers. Click a poster to watch its respective newly released trailer. The Great Gatsby. Here is the latest trailer for the F. Scott Fitzgerald classic re-envisioned for the big screen under the direction of Baz Luhrmann. Pushed back to May 10, 2013 from a Christmas 2012 release date, enjoy this trailer featuring more variety of music for this tale starring Leonardo DiCaprio, Joel Edgerton, Carey Mulligan, Tobey Maguire and more. The Mortal Instruments: City of Bones. This newest book series-to-film story stars Lily Collins as a young “normal” girl living in New York City who discovers more about her past and her family when her mother is taken by a demon. Her quest begins with the help of others who, used to this “hidden world,” aid her in finding her mother and, even more importantly, in finding her strength that may just hold the key to eternal victory. Look for this “Twilight-Killer” on August 23. Grown Ups 2. Adam Sandler and the crew return. Moving his family from the big city to his hometown, Lenny (Sandler) finds time to share fun with family and friends and finds he has more to learn from his kids and the “new” neighborhood crews than he thought. I enjoyed the first film, but I am not excited about this one. Starring Sandler, Kevin James, Chris Rock, Salma Hayek, David Spade, (NO Rob Schneider), Aly Michalka, Andy Samberg, Taylor Lautner, Shaq and more, look for the grownups on July 12, 2013. Only God Forgives. I normally do not post red-band trailers (red-band = Rated R), but this one is too fantastic. Plus, short of a few quick snippets of violence which I’ve seen worse of in green-band trailers, I saw no need for the “redband” rating. Director Nicolas Winding Refn (Drive) brings this story starring Ryan Gosling as a man pushed into a situation to fight against a corrupt police lieutenant in Bangkok. Check out the trailer for Only God Forgives. The Purge. Imagine a United States that is literally free of crime 364 days of the year due to 1 day (12 hours of 1 day) being set aside for all crime to be considered legal. This curtailing of crime seems acceptable to the society shown in the movie and one family prepares like normal when the day approaches. Only, this routine purge ends up far from routine when a stranger seeking asylum from those wishing to kill him shows up on their doorstep. Those wishing to kill him expand their obsession then to the family helping him. Can they survive the entire night? Ethan Hawke stars in this May 31 release. 2 Guns. Denzel Washington and Mark Wahlberg star in this action thriller in which two undercover federal agents, unaware of each others’ true employment, are put in between a rock and a hard place when their investigations of one another find them as the victims of a setup from the mob they are after to begin with. Watching the trailer almost tells you all you need to know and makes me assume that you only need to show up for the last 40 minutes of the movie to know how it ends. meh. This one hits theaters on August 2, 2013. A SINGLE SHOT revolves around a simple man, John Moon, a tragic accident, his despair and the need for immediate redemption. Moon, while stalking a deer out of season, accidentally shoots and kills a teenage girl. When trying to dispose of her body in a cave, he stumbles upon a hefty sum of money. This starts a tense and thrilling adventure and a deadly game of cat and mouse between hunter John Moon and the hardened backwater criminals out for his blood. John Moon will need to outsmart those hunting him down to save himself and his family. Based on the book of the same name authored by Matthew Jones, A Single Shot releases on this year in numerous festivals. Releasing later today: A new trailer for the October remake release of Carrie starring Chloë Grace Moretz, Julianne Moore and more. My favorite trailers from today: The Purge, Only God Forgives, and The Great Gatsby. Which ones are your favorites?? Limited Release: Trance, The Company You Keep, Upstream Color and more. I’ll definitely be seeing Only God Forgives, but I’m dreading Grown Ups 2. Only God Forgives looks really good and The Purge seems very interesting. Denzel is my favorite actor so I’ll definitely check out 2 Guns. The latest Great Gatsby trailer is so sensational I don’t think the film itself could live up to it, but I’m still excited to see it and really hope Baz delivers! Oh, I saw Mortal Instruments last nite, meh, yet another supernatural teen flick. Intriguing concept but I doubt the execution would be any good. I think you’ve made the right call on The Great Gatsby! 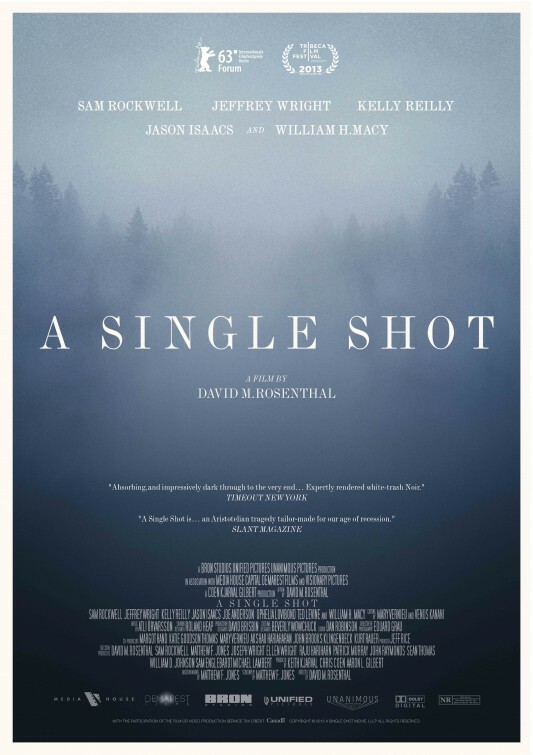 Really intrigued by A Single Shot. Has a Coen Brothers vibe that I really dig. I’m sure it’ll be super depressing, though, ha. Only God Forgives looks great too. Love that collaboration. Grown Ups 2…just ugh. Why, world, why?! I’m sad that Grown Ups 2 looks terrible. I loved the first one. and can you tell me what your thoughts are on why Only God Forgives was redbanded? I have no idea. OK, I seem to have gotten my internet settled down enough that I can stream things regularly, so I’ve been doing a bit of catch-up here. 😀 On that note, although it was from a few weeks back, I have to say that Turbo looks absolutely terrible. This Mortal Instruments looks like it has some potential. Might be dumb but there’s a chance it could be intelligent. At least it’s not having the kids fall in love with the demons. Only God Forgives is an odd one. Usually if an apparent action film has an “artsy” trailer, I assume it’s going to be awful (because it usually is). This seems to be interesting, though. Contrariwise, the trailer for A Single Shot didn’t do a thing for me. Watched it, don’t feel like I saw anything about the film. The Purge… bit conflicted on this one. The premise for the setup is pretty stupid — crime won’t go away just because it’s legalized one night a year, there’s way too much wrong with that assumption. The premise for the core of the film isn’t so bad though. That’s just “family with safehouse protects a guy and psychos come after them too.” That’s workable. But the fact that they start with such a dumb premise makes me think the whole thing will be dumb. 2 Guns could be a fun, if standard, action film. The English Teacher is probably OK, but probably not great. Carrie looks fairly good; of course, I haven’t seen the original nor read the novel. This is the End is almost certainly dumb, but it looks like it has some good laughs. It might occupy that sweet spot where stupid=funny. It’s got a chance anyway. You have more hope for Mortal Instruments than I, but, you’re right, at least it’s not having kids falling in love with demons. The premise is original for The Purge but it does take us out of reality. Turns into a scifi version of The Strangers I think. not sure. like you, I’m conflicted. I also have not seen or read Carrie and am curious about this introduction to it for me. This is the End looks dumb, but fun. Like you said. Great breakdown of the trailers this week. Thanks, Morgan! I really like Only God Forgives trailer. Carrie trailer has some good moments but I find the idea of remaking it and casting Chloe Moretz as Carrie to be despicable. I hate that Gatsby trailer, it looks chaotic and ridiculous but I LOVE new Lana Del Rey song in the background. i don’t feel the same about the Carrie remake, but that’s probably because I haven’t seen the original.